Journal of Scientific Exploration, Vol. 25, No. 3, pp. 609-610, 2011. 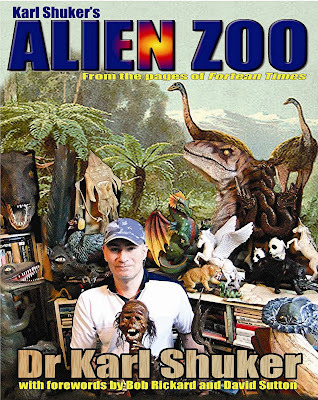 Karl Shuker’s Alien Zoo by Karl P. N. Shuker. CFZ (Centre for Fortean Zoology) Press, 2010. 392 pp. $26.99, softcover. ISBN 9781905723621. This book is an excellent introduction to cryptozoology as well as a feast for people already interested in the subject. There are interleaved chapters dealing on the one hand with specific topics in some depth, on the other hand with snippets of relevant news items from the years 1995 to 2010, arranged chronologically. The items are from columns Shuker wrote for Fortean Times, and several have been updated with more recent information. The wide scope of cryptozoology is illustrated, and the approaches to specific subjects illuminate the inevitably interdisciplinary character of cryptozoological research: an inescapably needed background of zoological knowledge, plus sophisticated understanding of how to weigh different kinds of evidence, which ranges from actual specimens through photographs and paintings of (claimed) specimens through written reports from the most varied sources to, not least, eyewitness accounts. That complexity calls for expert guidance, and Shuker is fully equipped to provide it, with a Ph.D. in zoology, membership in learned societies, and long fascination with and work in cryptozoology. Those credentials do not necessarily entail good judgment, of course, and in this vital respect Shuker is very trustworthy indeed. He is determinedly skeptical and his assessments are based squarely on empirical evidence. In cryptozoology as in anomalistics more broadly, the rarest and most desirable resources are compendia that can be relied upon to be factually accurate and judicious in making judgments. In those respects, I rate Shuker’s works as highly as I (and others, of course) rate the works of Jerome Clark. As to specifically cryptozoology, Shuker’s work inevitably reminds one of that of Bernard Heuvelmans, often described as the founder of cryptozoology and also a zoologist by orthodox training. Heuvelmans broke barriers and displayed the bravado needed by those who bring into existence some new institution or subject; Shuker displays the qualities needed by the successors who bring more order and judiciousness to the field. Alien Zoo offers the pleasure of browsing in the knowledge that one will be able to enjoy it over a long time: Each of the “topic” chapters is an independent essay, and the collections of news snippets in each year or set of years can be taken in one or in several gulps. The introductory essay, debunking a story published by a quite well-known writer on oddities of Nature, sets the stage appropriately by illustrating Shuker’s diligent perseverance in tracking down evidence and then determinedly hewing to that evidence. Over the years I’ve read quite widely in cryptozoology, yet I found new specifics here as well as welcome interpretations of more familiar subjects, for instance on the “mystery cats” reported from all sorts of places around the world. New to me were such things as angel feathers, bacteria reproducing in clouds, or the possible relationship between fruit bats and primates—the latter highly instructive about the complex task of tracing evolutionary lineages even in the era of DNA analysis. I recommend Alien Zoo highly and without reservation. Readers should not neglect what looks at first like many pages of advertisements at the back of the book: On pp. 381–382 there is a list of other works by Shuker that those who appreciate Alien Zoo will then want to read, too. One of my own favorites is the 1995 In Search of Prehistoric Survivors. HORSE-COWS, SHEEP-PIGS, AND THE REAL BABE!